Injuries can occur from a variety of reasons. While it can be tempting to curl up into a ball and “take some time off” from your physical activity, this can make you feel even more immobile and stiff. Besides increasing your flexibility and circulation, exercise is a vital component for releasing those positive endorphins that make us feel happy. Did you know that one of the most common side effects of an injury or surgery downtime is depression? 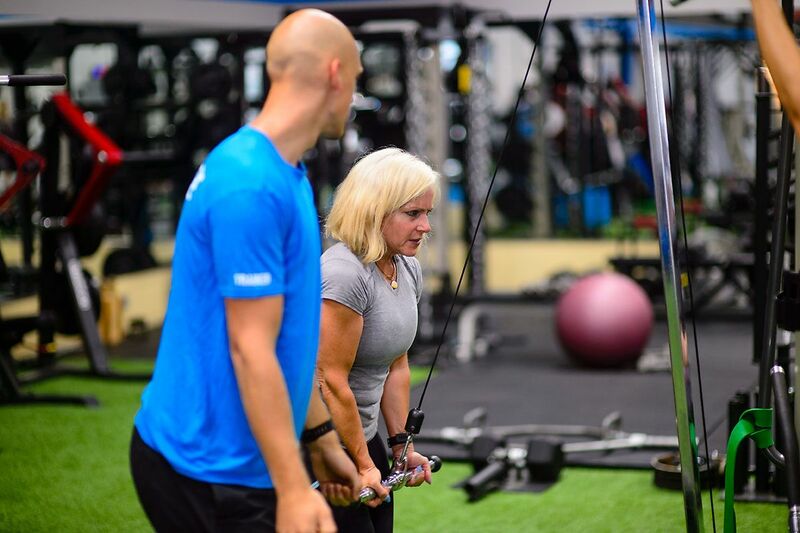 One Life Fitness in Kelowna can help you assess your current activity level and customize a gradual plan to get you back into the game! Many of our clients need to undergo Physical Therapy first prior to coming back to the gym. Be sure to have your doctor assess your situation and follow the PT protocol before trying to begin or resume your gym routine. It is imperative to complete your physical therapy recommendations and take things slow in order to prevent a chronic injury or further damage from occurring. Deconditioning is a natural side effect of taking time off to heal. It is important to stay positive and know that you will attain your fitness goals once you have adequate time to heal. The immediate time after a hamstring injury for example is known as the acute phase and can range from 1-5 days for minor issues. The main goal during this time is to maintain range of motion and decrease inflammation. A great acronym to remember is “PRICE” which stands for Protection, Rest, Ice, Compression and Elevation. Utilizing items like crutches, tensor bandages, slings and similar apparatus can be helpful depending on the injury. One Life Fitness likes the flexible, gel-filled ice packs as these can easily be moulded to your body as opposed to the more rigid styles. However, in the event of an injury, any type of ice, including a bag of frozen blueberries or frozen peas, can substantially reduce swelling and help dramatically. This secondary phase of an injury is the timeframe from 5 days to 3 weeks post injury. During this period, the inflammation levels are hopefully lowering enough to begin some strength training. Swimming can be a great way to ease your muscle groups back into mobility during this time. Overcompensating one side of your body during recovery is another common issue. Our bodies naturally pick up the slack when a group of muscles is not functioning at optimum levels. This can lead to fatigue and exhaustion of the healthier muscle groups. One Life Fitness in Kelowna can work with your individual situation and provide some excellent stretching and balance exercises you can additionally work on at home to help you prevent a recurrence. It can take up to 6 months or longer to complete all of the phases (Remodelling state, Functional state, return to cardio) of an injury and be able to return to your original game. Every injury is different and much depends on how much soft tissue damage has to heal. Be patient throughout the process. Pushing your body before you are ready will only lead to negative side effects. The dedicated team at One Life Fitness can help you regain muscle mass through a variety of strength conditioning exercises. For example, if you are recovering from a back injury, working on your core can dramatically help your back muscles become stronger. In fact, core muscle conditioning often comes into play with a variety of injuries. It is common to lose your balance more easily after an injury and balance exercises are excellent to incorporate. Working on strengthening the surrounding muscle groups around the injury site is a huge part of the rehabilitation process. This is great advice on a daily basis however, especially valuable during the healing phase. Help your body deliver nourishment and hydration by eliminating lactic acid build up and accumulated toxins by drinking more water. This will help increase your energy levels and focus as well. One Life Fitness is dedicated to helping you achieve your healthiest and happiest self. Stop by today to view our facility and speak with our professional staff. We look forward to helping you look and feel your very best, regardless of where you are starting from. Learn how incorporate strength training, balance exercises and endurance while increasing your range of motion for optimum health, injury recovery and prevention. We are excited to work with you!